I just bought a lovely bag of Garam Masala, and was all ready to grind some when I got home! But when I opened it, I found something I didn’t recognise — at first I thought something had gone mouldy, but there’s enough of this in there that whatever it is, I presume it’s supposed to be in there. It looks to me like a fungus or lichen of some sort. The list of ingredients includes “trifle” — could that be a mis-spelling for some Indian species of truffle, perhaps? So I think this is probably the right identification; and I’m reassured that it’s not something wrong with the mix; but I’m still quite intrigued, and would love to hear more about this ingredient from someone who knows it better! Just found out from a friend..its also called Kalpasi or Kallupachi (literally Stone Flower / Moss) in Telugu and is a not so commonly used spice in Chettinad cuisine. So, probably it is not the very generic garam masala (which is more common in the Northern part of India than the South) but something very specific to use in certain dishes, say like the Punjabi Garam Masala. Also hear that it is used in Goda masala, something more common in the Western parts of India (goan and maharashtrian cooking). 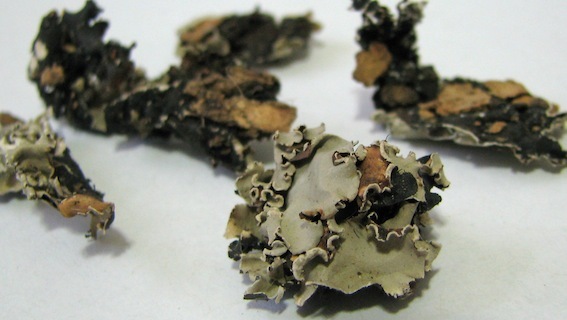 This is an edible lichen which is commonly used in Indian spice mixture especially curry masala. I am using this everyday in my kitchen. it gives a very pleasant smell to the curry. About 100gm of this lichen is added to make 750 gm of curry masala powder. Around 10gm of curry masala powder is added to one liter of curry (this is apporximate quantity but it is in this range) so you can imagin how littel quantity is required. At first I thought those were wood ears, but checking around, they look more like cloud ears. In answer to your question, yes, they are a fungus/mushroom that grows on the sides of trees. I've always cooked with them in Chinese cooking. As for the trifle, I haven't found any connection between wood ears, cloud ears and the word trifle, although depending on who was doing the translation, as you note, truffle could have become trifle, and cloud ears and truffles are both fungi (although the similarity stops there). The full name is lichen stone flower, in Indian it has many names as, patthar ke phool/dagad phool/kalpasi, and mostly used in North India, Goa and Maharashtra. It is used particularly in kabab dishes namely galauti kabab, kakori kabab and many other dishes, maharashtrian goda masala also have it. It is found in foothills of himalaya mountain, after monsoon, locals collect it and sell/supply. Yes , black stone flower , a lichen / moss , which only grows where the air is absolute pure . It disappears when pollution starts . I had never known one could use it in food before seeing it in a Hyderabadi grocery . I had used it for natural dying years ago , and the amazing thing was that wool dyed with this moss keeps the forest smell for years .This inspired me towards a special rice dish ; rice in rice-cooker with half water , half rose or orange-blossom-water , hand full black stone flower , cinnamon sticks , star anise orange and lemon peel .... The smell filling the house is unbelievable , as the taste . I once had a biryani at a Marathis friend's home and the taste was incredible. He mentioned that he used a fungus, specific to his region. For years I had looked for the name and never found it till finally I came across dagad phool randomly. Even Indians are mostly not aware of this - a very region specific spice. 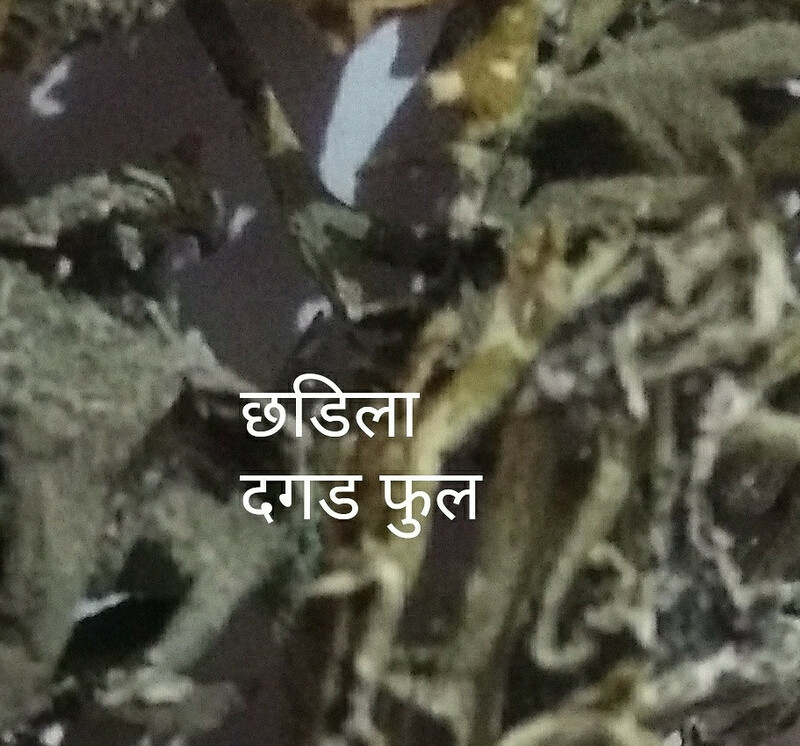 छडिला किंवा दगड फुल हलबा सावजी यां लोकांना गरम मसाला used in purely non-vegetarian dishes. This type of food famous in Vidarbha region. Not the answer you're looking for? Browse other questions tagged spices indian-cuisine food-identification or ask your own question. Can an American substitute for garam masala be made? Why is garam masala in many curry paste/powder recipes? What is the combination of spices for garam masala? Can I swap sabji Masala for Tandoori Masala in this recipe? What do I do with this spice mix? What is this bean called?